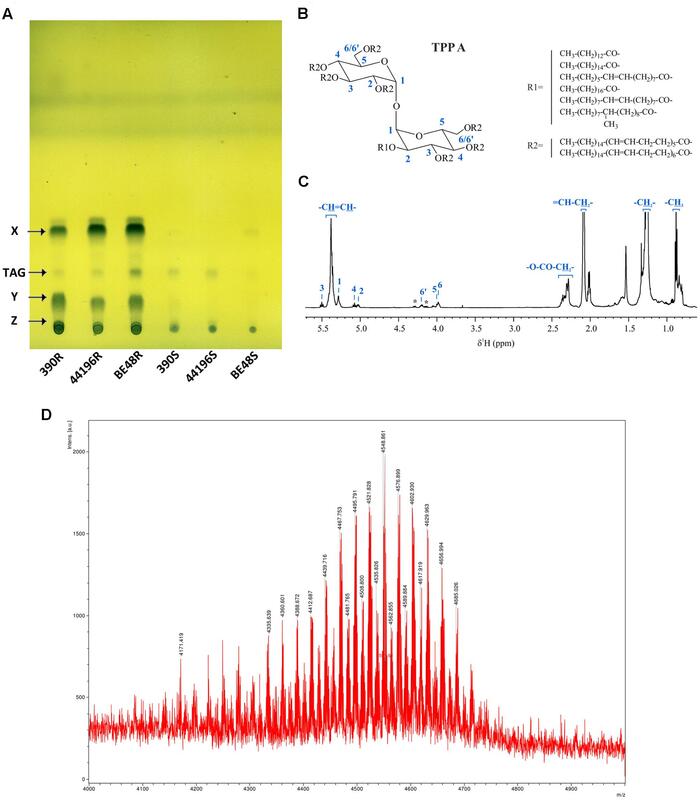 Object: To evaluate how spinning rate affects mobile lipid (ML) resonances visibility in HR-MAS spectra of C6 glioma cells and artificial oil bodies (AOB), as models of cytosolic lipid droplets. Materials and methods: Using C6 cells and AOB of two different sizes, 780 ± 580 and 240 ± 293 nm, as models, we acquired HR-MAS pulse and acquire spectra at different spinning rates between 500 and 15,000 Hz, all at 37 °C. Results: Sample spinning at 15,000 Hz increased by 2.3 and 4.6-fold with respect to 500 Hz spinning the area of resonances corresponding to ML at 0.88 and 1.28 ppm, respectively, for log phase C6 cells. Furthermore, postconfluent C6 cells displayed an increase of 2.5-fold at 0.88 ppm and 4.2-fold at 1.28 ppm. These changes were reversible upon low speed spinning. 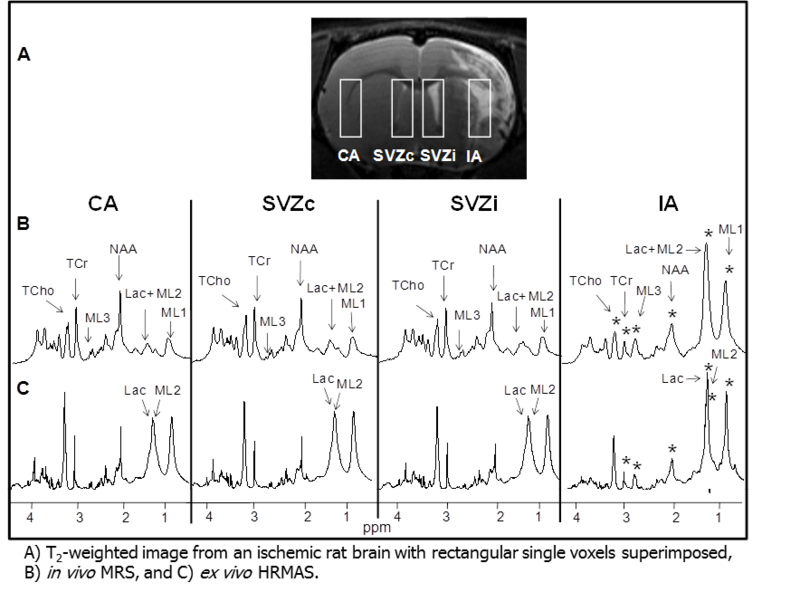 AOBs did show much lower ML area increases (1.4–1.5-fold) upon high-speed HR-MAS. Conclusion: ML can be reversibly mobilized in C6 glioma cells by high-speed HR-MAS, partially unveiling the NMR “invisible” ML pool. A small part of the ML pool also shows reduced visibility in freely tumbling AOBs. Effect of the spinning rate on the visibility of several resonances in C6 cells of day 4 of culture. (LEFT) The graph shows the variation of areas with increasing spinning rates for mobile lipid (ML, 0.88 and 1.28 ppm), creatine (Cr, 3.03 ppm), and choline containing compounds (ChCCp, 3.25 ppm). The inset shows an expanded view of the ChCCp curve. Asterisks identify significant changes at p-value < 0.05. 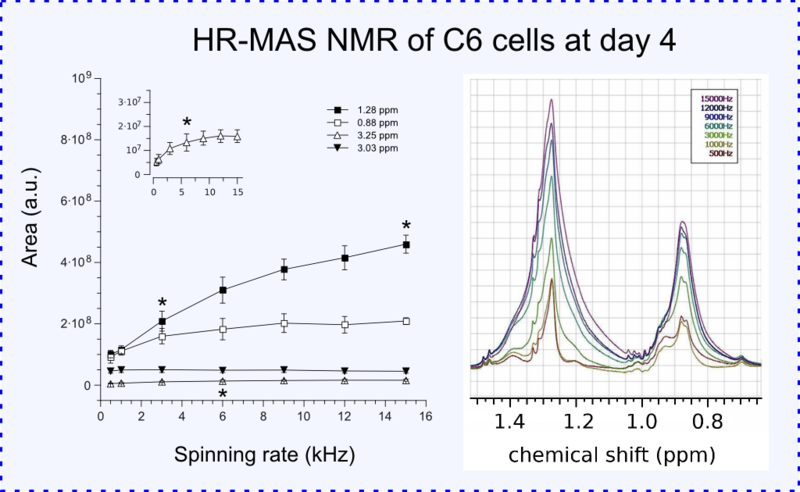 (RIGHT) Expanded view of the HR-MAS spectra of C6 cells recorded at increasing spinning rates. The increase in the area of mobile lipids peaks at 0.88 and 1.28 ppm at higher spinning rates is clearly visible. © 2012 – 2014, Miquel. All rights reserved by the author(s) and Universitat Autonoma de Barcelona except for texts and images already copyrighted by third parties (e.g. journal publishers) and used here under the fair use provision.